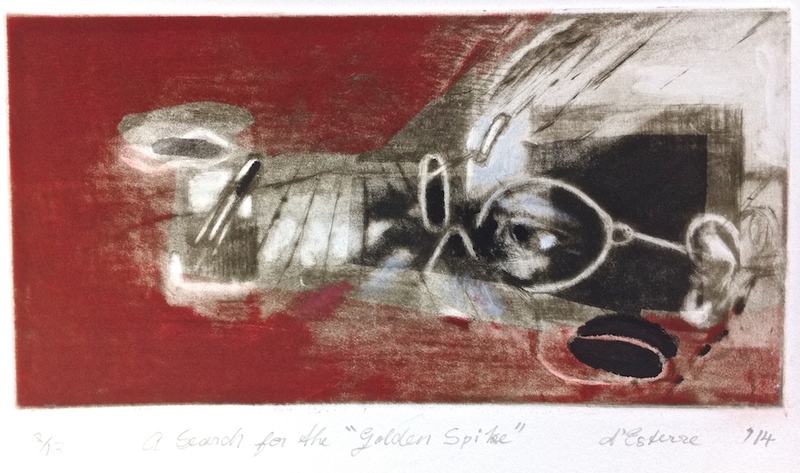 I scraped off an earlier image from the copper plate which was a variable edition titled A Search for the “Golden Spike”, 2014 The changed plate, now destroyed finished that edition. 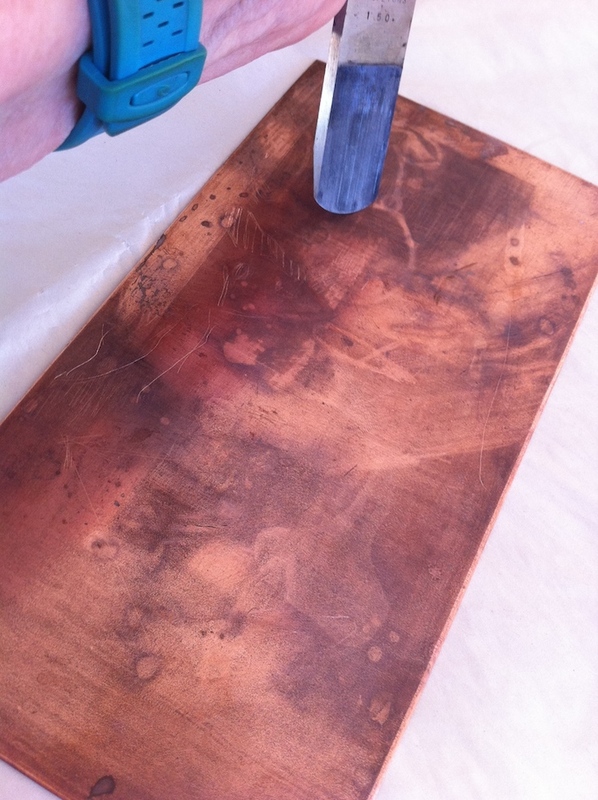 However it lay in my studio for a few months as I intended using the back of the plate for another etching. Then, as frequently happens, another image popped up – pre-conscious imagery where a seemingly complete mental picture in my mind’s eye seems so real and demanded attention. The dark areas in the earlier image were made using the aquatint and acid process.I wanted to try out a new tool that creates darkened areas and is called a rocker which doesn’t require an acid bath. 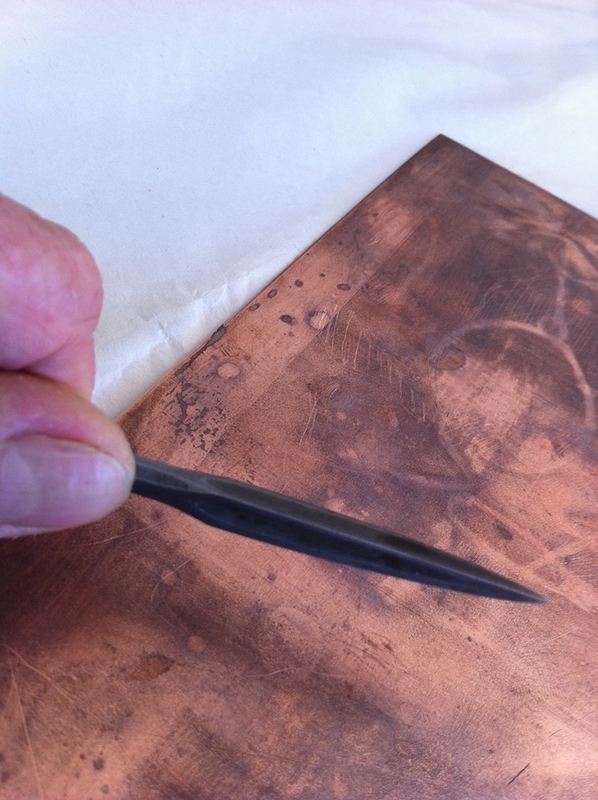 Basically its a drypoint method called mezzotint. 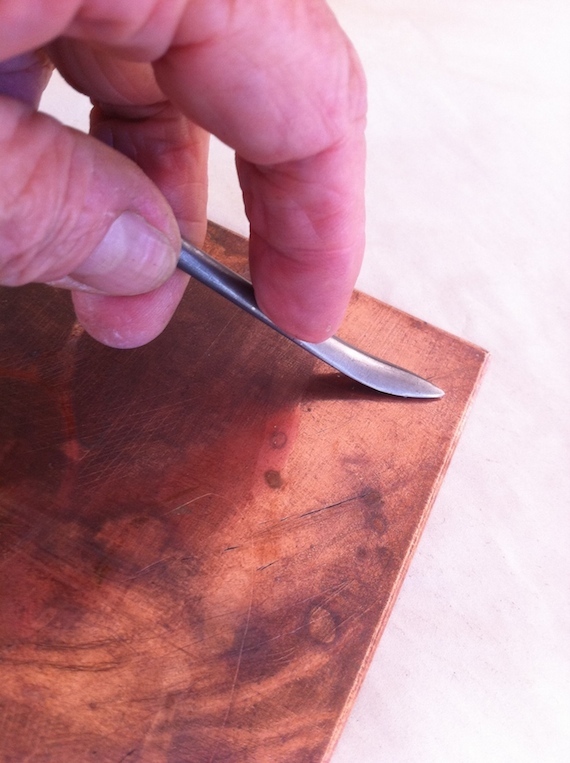 The rocking motion and pressure applied both make dotted ridges that imprint into the copper so that when ink is applied it is forced into these depressions as a way to produce a dark section. 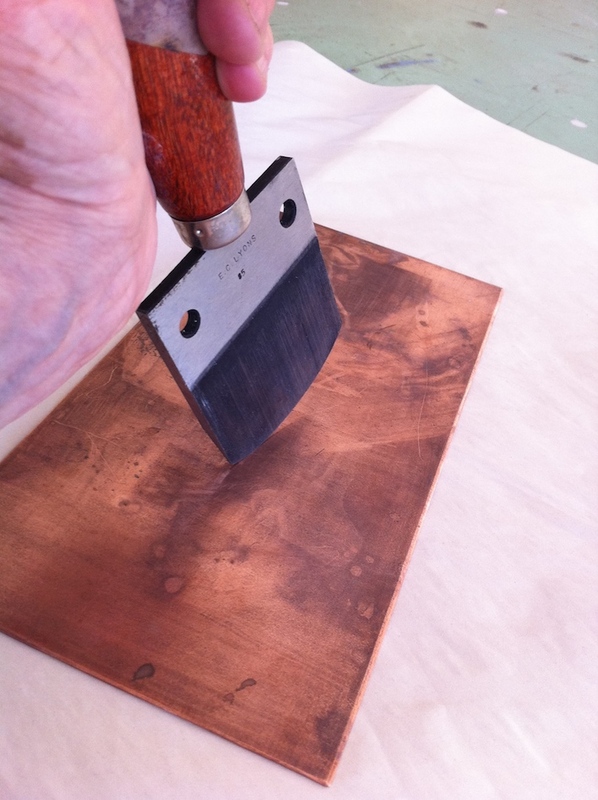 In this next stage where I destroyed the image on the plate my main tool was a scraper whereby I removed much of the mezzotint and then burnished the scraped area so that ink could not adhere to the surface before printing. The horizontal formatted image above changed into a vertical composition. The head and landscape seemed to dissolve into each other within my mind’s eye – less head, less structure all over and a more atmospheric look.The mind’s eye image seemed to be about facial features that mimic aspects of the landscape. 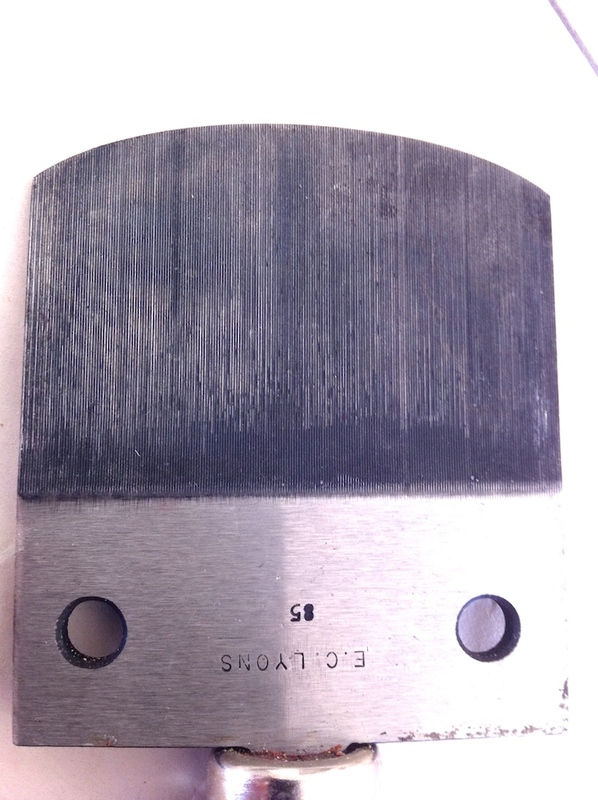 I scraped and burnished the central area and then reestablished small areas around the head with roulettes and etching needle as well as strengthen the linear highlights. Several proofs depicted in the vertical formatted image. 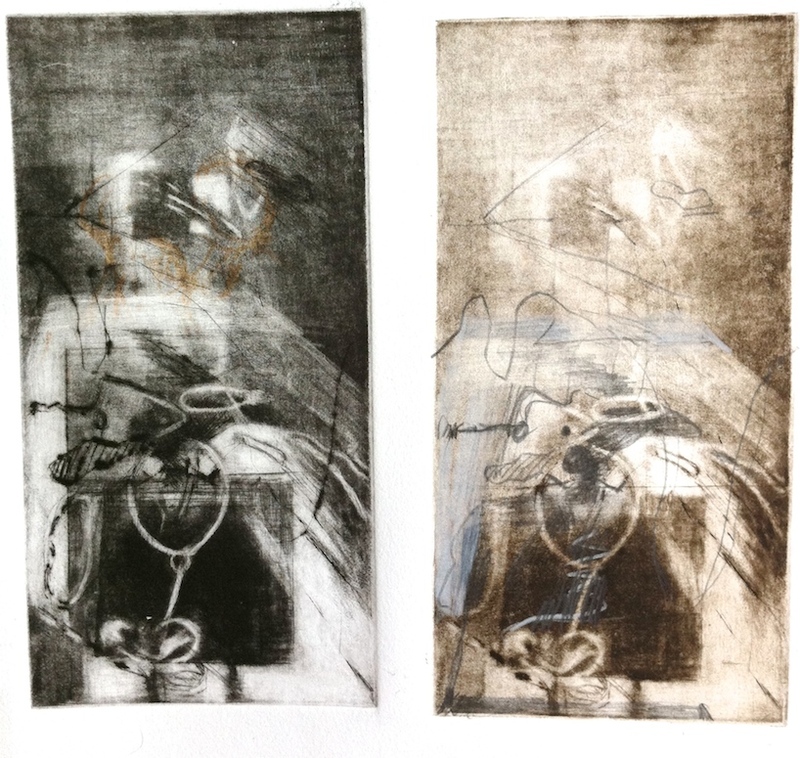 The second print shown here was proofed first and the first was the ‘improved’ version which was too fussy. I liked the more ethereal first effort. So I scraped off the top and part of the central ‘horizon’ , simplified the busy bits and added a chine colle. 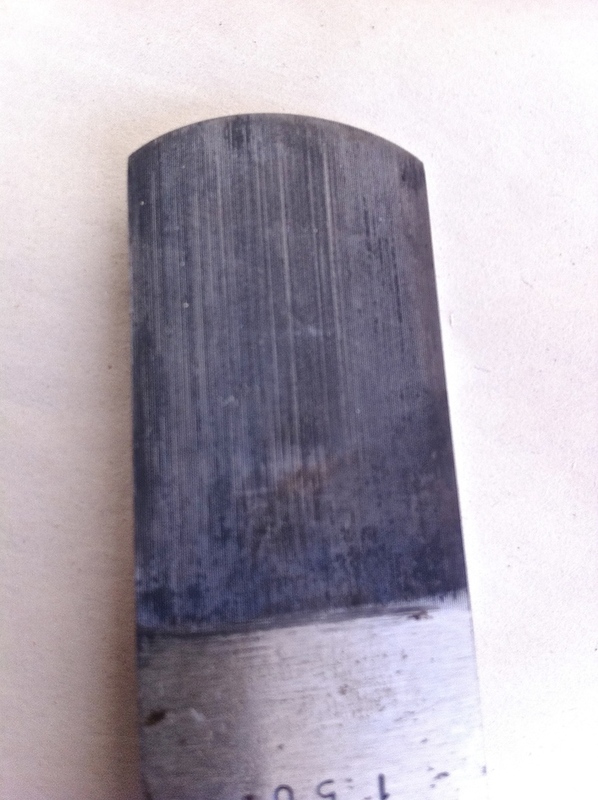 The first image with off-white coloured chine colle is quite atmospheric and in the second version the chine colle didn’t take and peeled back, away from the surface making a line gap dividing the top from bottom. I used orange pastel to join the gap. Still not happy with the sky area, I turned it upside down which gave me another idea that may be suitable for an oil painting. More proofs are required to resolve the image. Categories: Etching | Tags: chine-colle, etching proofs, monochrome | Permalink.